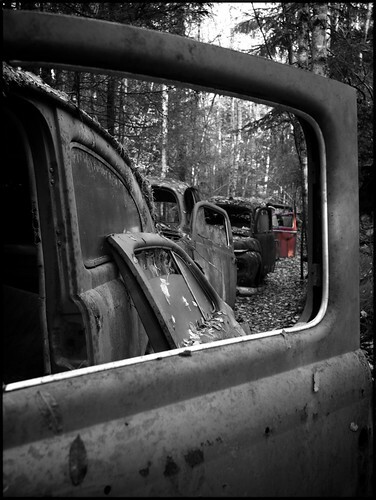 Another “Try Again Tuesday” This from a trip to an abandoned Sanatorium here in Norway. Norway celebrates its 200 years of independence . Hipp Hurra. This is a long partially collapsed structure with an iron or steel sheeted roof.Here the Turf was laid out for drying.You can still see the wires that run back and forth along the whole length of the shed. As far as I know the turf wasn’t used for fuel like in Ireland but may have been used for roofing and the like. I’ll have to find more . This shot was taken using the built-in flash on the D800. Keen eyes will notice the lens shadow from the 16.35 mm I was using at the time. End Of The Road., a photo by Davidap2009 on Flickr. 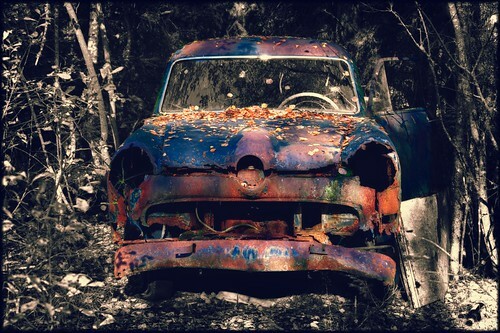 Rusty, a photo by Davidap2009 on Flickr. Doors & Windows, a photo by Davidap2009 on Flickr. Back to the car cemetery.